This book comprises two fables: Aesop’s The Goose that Laid the Golden Egg, and the Buddhist tale The Tortoise and the Geese. In The Goose that Laid the Golden Egg, a foolish hunter captures a goose. When the creature lays a curious-looking egg, he doesn’t know what to do! He brings the egg to a friend in town who recognizes that it is, in fact, a golden egg. The hunter is able to sell the eggs, and begins to lead a life of luxury. Sadly, “like many people, the huntsman wasn’t happy with what he had” and he decides to cut open the goose to get all the eggs at once. His greed is his downfall. In the second fable The Tortoise and the Geese, tortoise just won’t stop talking. Eventually the other animals can’t stand it and leave him to talk to himself. One autumn, two geese come to his pond and befriend him. When it is time for them to fly home, tortoise begs to accompany them. He has devised a way for them to carry him. The geese have to hold a piece of wood and tortoise must hang onto it with his mouth. The only catch is: he can’t talk! Needless to say, he cannot resist and falls from the sky, only to land on a leafy bush and almost on hare. Tortoise apologizes to hare and admits that sometimes he talks without thinking – tortoise has learned his lesson. Both fables are illustrated by award-winning children’s book illustrator, Jago. On his website, Jago describes himself as “loving strong colors and interesting textures.” This is apparent in the beautiful and unusual illustrations in these stories. Jago is also the illustrator of other Language Lizard offerings such as Fox Fables, The Elves and the Shoemaker, and Little Red Hen and the Grains of Wheat. 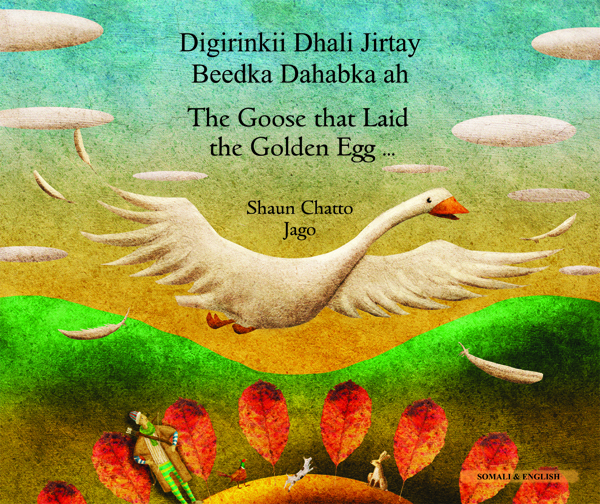 Goose Fables (The Goose that Laid the Golden Egg) is available in English with: Arabic, Bengali, Chinese Simplified, Chinese Traditional, Farsi, French, Hebrew, Lithuanian, Polish, Portuguese, Russian, Slovakian, Somali, Spanish and Urdu. If you’re interested in purchasing this book, please visit the webpage at www.languagelizard.com/Goose_Fables_The_Goose_that_Laid_the_Golden_Egg_p/goo.htm. Previous PostGrants and Funding for Bilingual ClassroomsNext PostThe Bilingual Child Month Is Here Again!